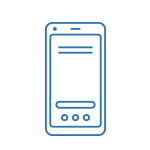 Find which products and brands are the most reliable. 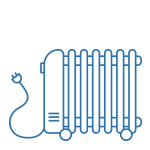 Our members have once again told us if their appliances and devices – from expensive cooktops to cheap-as-chips heaters – are reliable and whether they are satisfying to own. We asked our members about products they’d bought new since 1 January 2013. We wanted to know the brand, the year it was bought and whether it had ever needed repair. We also asked respondents if they were satisfied with their product. Our thanks to all who participated. We only analyse brands that got 30 or more responses in a category. For each brand, we calculate our reliability score as the percentage of its products that have never needed repair. We report on other measures only if they are statistically significant results. Where we haven’t re-surveyed a particular product, we’ve included the reliability data from our 2016 and 2017 surveys. 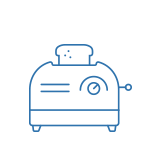 We’ve been collecting appliance reliability data from our members for more than a decade. We don’t ask about every type of product every year, but some, such as vacuum cleaners and washing machines, feature regularly. We assessed if product reliability was improving, and if the same brands consistently popped up at the top, or propped up the bottom, of our tables. 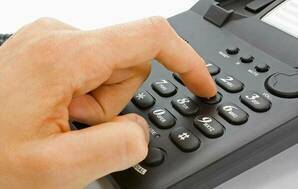 Reliability is improving, at least for the popular big-ticket products. The average increased from 84% in 2009 to 89% this year, and all five products have improved. 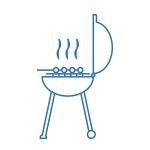 It’s no surprise fridges are more reliable – they’re relatively simple beasts. 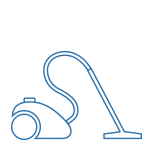 Vacuum cleaners have a harder life, clogging with dust and dirt and getting dragged through the home. There’s even more that could go wrong with a washing machine or dishwasher as they deal with heating and cooling, filthy water and detergents. 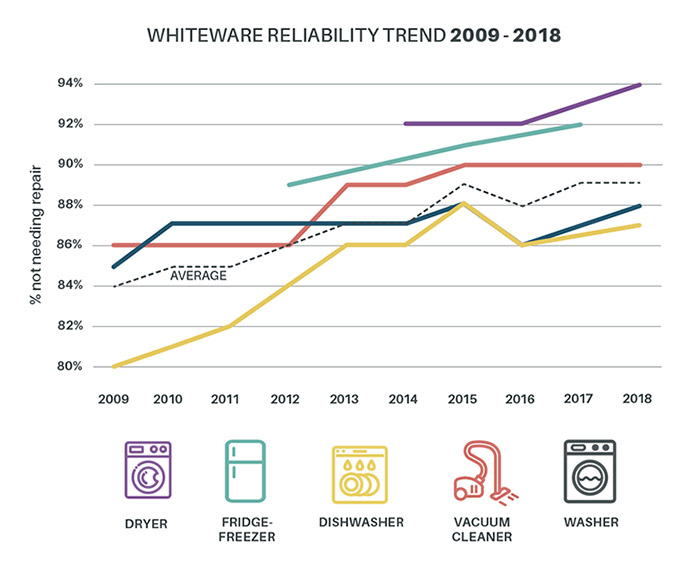 Dishwashers, although the least reliable of the five, have seen the largest gain in reliability since 2009. Two names regularly crop up near the top of our reliability and satisfaction charts for whiteware products. Miele has made the “top dog” slot its own for many large appliances, while Bosch usually isn’t far behind. That performance is most apparent in the least reliable of our major whiteware products: washing machines and dishwashers. But Miele can’t rest on its laurels. 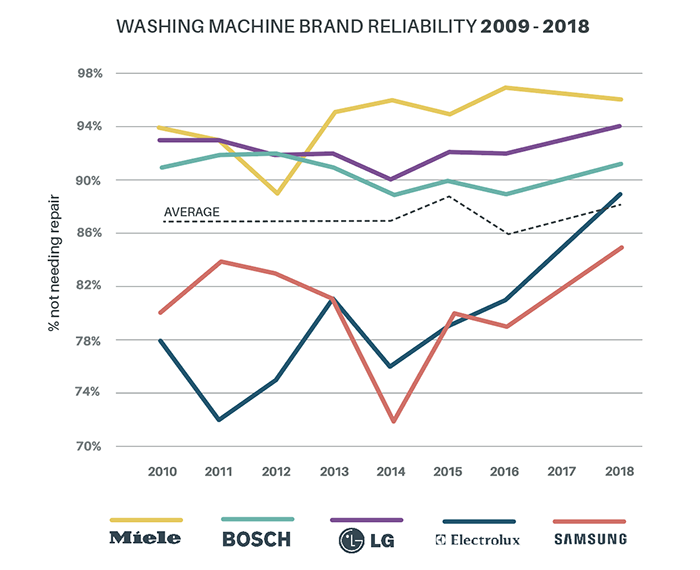 LG washing machine reliability is gradually improving – it’s overtaken Bosch and is right on Miele’s tail. Even some less reliable brands, such as Samsung and Electrolux, have stepped up their game over the past few years.